Being happy at work seems the toughest job these days. The office cannot be our second home and the work pressures leave us with a little time to think about our personal goals. The data also reveals that work-life stress is the cause of so many health problems, such as a headache. At MedHouseCall, we experience many cases where patients are suffering from anxiety issues. They are always comparing them with others and that causes inferiority complex. Our homecare physicians also look after your psychological well being and offer you a solution that keeps you away from the stress. Unhappy employees are there in every organization. Do you know that unhappiness is also the reason for severe health problems which can hardly be treated by medicines? No matter how big your company is, dissatisfaction is a very common thing. Doctors at MedHouseCall offer some solutions that help you nurture the positivist in your working area. A few easy steps allow you to get rid of unhappiness. When you start you work with a sense of learning, there would hardly a thing that makes you stressful. Help others solve their problem and go ahead in your life. Learning will make you happy. If you fail, don’t be upset. Analyze the reason for your failure and make a stronger plan than before. Feel comfortable when you are at work. Decorate your place with the things you love or with the details you need. It should be like your place which makes you feel happy. Many companies believe in employee referral policy to make the environment work-friendly. So, having a friend at your workplace is good for you. Share your thoughts with them and feel relief. We understand it is tough, but it helps you be stress-free. There are two different worlds for professionals – personal and official. When you are working, you need to concentrate on the things that improve your ability as an employee. Believe that whatever you are doing is helping you in long run. The skills you are learning and the knowledge you gather all have some purposes. An expression of gratitude makes us feel good. So, always thank your superior or subordinates for their help. When you start a good culture, others will definitely follow you. An active life needs a healthy living. So, include vegetables and fruits in your diet. Be hydrated to avoid general health issues. 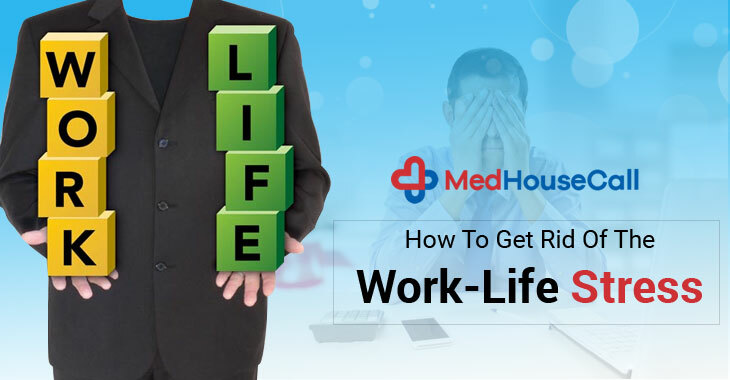 Work life stress is becoming a growing concern for the healthcare industry. Though different campaigns have been organized to make people aware of it and offer some easy solutions, nothing can bring a big difference to date. At MedHouseCall, we are also joining the drive and help people enjoy their work. MedHouseCall is known for offering home visit physician services in Ontario, Canada. Our licensed doctors treat your health issues at your home so that you can feel comfortable during the treatment process. We are the trusted Public Health Agency of Canada that takes care of your health and offers advice to people for their healthy living.